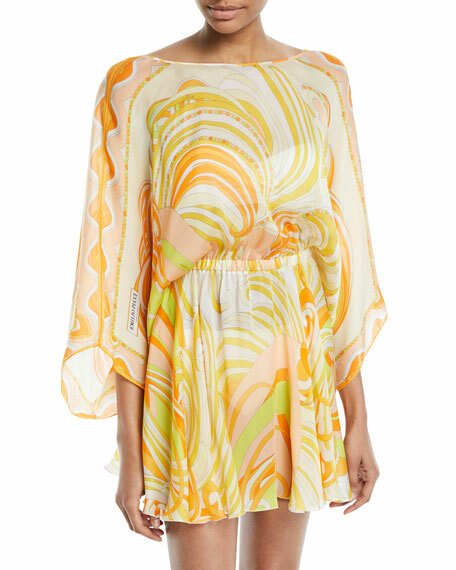 Emilio Pucci "Baia" printed silk chiffon coverup dress. The name Emilio Pucci is synonymous with kaleidoscopic prints and forward-thinking favored by jet-setters the world over. Emilio Pucci himself was a Florentine aristocrat whose legend was born when photos of his skiwear ran in Harper's Bazaar in 1947. Through the years, Emilio Pucci designs have been favored by glitterati around the globe, and today the line is helmed by Massimo Giorgetti. Headquarters are still located at the Pucci family's palace in Florence. For in-store inquiries, use sku #2528319.